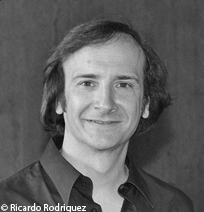 An Argentine composer born April 25, 1961 in Buenos Aires. After gaining a diploma in composition at the University of La Plata in Argentina, Mario Mary continued his training at the GRM, the Paris Conservatory and Ircam. He obtained a doctorate in the aesthetics, science and technology of the arts, at the University of Paris VIII, where he taught computer-assisted composition (1996-2010). A teacher of electro-acoustic composition at the Académie de Musique Prince Rainier III in Monaco, co-founder and artistic director of Monaco/Electroacoustique (international electro-acoustic music meetings), this teacher-researcher also lectures in Europe and South America. Mario Mary composes mainly electro-acoustic works (Fuite en avant, premiered at Festival Synthèse, 2005 ; 2261, premiered at Radio France, 2009 ; Le sophistiqué son du Dasein, premiered at MPAA, 2018) but also chamber works with or without electro-acoustics (La orilla secreta for cello, piano, percussion and electro-acoustic sounds, premiered at Rencontres internationales de musique électroacoustique de Monaco, 2011 ; No sé, musical theater for mixed voices, premiered at Buenos Aires, 2014). He has also made experimental videos that relate to his works (Un souffle de vie, premiered at Radio France in 2006). Since the 1990s his work has been directed towards the concept of spatial polyphony (Signes émergents, an electro-acoustic piece commissioned by the GRM, 2003) and a technique of electro-acoustic orchestration (Double concerto for clarinet, violin and electro-acoustics, premiered by Ensemble orchestral Contemporain during Festival Manca, 2012). Les partitions de Mario Mary sont inédites.